This survey was conducted in the months leading up to the unprecedented 2017 wildfire season. Given the tremendous impacts of those fires on the forests, communities, and citizens of BC, we shared the following key findings of this research with Chief Maureen Chapman and Mr. George Abbott, the commissioners of the BC Flood and Wildfire Review. Communities throughout BC are aware of and very concerned about current and future threats from wildfire in the wildland-urban interface (WUI). There is consensus that all agencies – municipal, regional, provincial, federal, and First Nations governments, industry and business, and individual homeowners – should be doing more to reduce wildfire risk. Nevertheless, not all communities have developed a wildfire protection plan. Barriers are greatest for communities with fewer than 5000 citizens and many First Nations communities, where engagement may be enhanced if issues of sustained funding, capacity and support are adequately addressed. Solutions to enable community action should prioritize the most vulnerable communities and must account for cultural differences. All communities in BC, including those who responded in 2016-17, are invited to participate in a new, updated survey. The purpose of the second survey is to improve representation of communities across BC, and to gain insights from all communities following the unprecedented wildfires of 2017. Our next steps include interviews with community leaders to co-develop community-based solutions to overcome the barriers preventing BC communities from undertaking management actions to reduce the impacts of wildfire. To participate, contact Dr. Lori Daniels (lori.daniels@ubc.ca). We thank the 77 respondents for sharing their community experiences and insights. A Community Solutions Grant from the Peter Wall Institute of Advances Studies at the University of British Columbia funded this research. Project partners are the Union of BC Municipalities (UBCM), First Nations’ Emergency Services Society (FNESS), BC Community Forest Association (BCCFA) and BC Wildfire Service (BCWS). The UBCM, FNESS and BCWS are members of British Columbia’s Provincial Fuel Management Working Group, which manages the Strategic Wildfire Prevention Initiative (SWPI). We thank UBCM, FNESS, and BCCFA for sharing the invitation for this survey to their members via newsletters and their websites. Daniels, L.D., S.M. Hagerman and S. Ravensbergen. 2018. 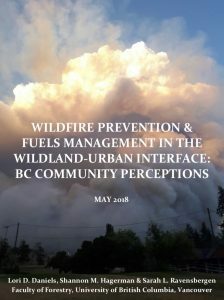 Wildfire Prevention and Fuels Management in the Wildland-Urban Interface: BC Community Perceptions. Report to the Union of BC Municipalities, First Nations’ Emergency Services Society, BC Community Forest Association and BC Wildfire Service. May 2018. 30pp.